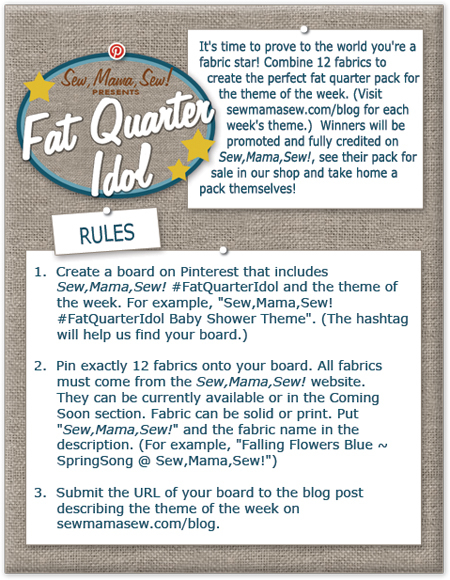 Miss Print: Fat Quarter Idol + a Giveaway!! Wow! Hard to pick but I think I am loving Hello Zig Zag alot. My favourite is the zig zag quilt pattern. Thanks for the giveaway. That's a hard question. If pressed, I would pick Sweet Starlet. Fabulous patterns! My favourite is Promenade! I love all of them, but I think that my favorite is the Hello Zig Zag. I LOVE Sweet Starlet, I pinned this to my pinterest weeks ago. Thanks for the giveaway! I think Promenade is my favorite! I love the Happy Churn Dash and it is happy colors. Thanks for the give away. I am a follower of your blog for a long while and do enjoy it. Promenade is my favorite, but I really like them all!! I am a follower of your blog - love it!! I really love Sweet Starlet even though it looks a bit hard for a mere beginner like me. Sunday Basket Brunch...always wanted to do a basket quilt and love, love the pattern! Love Sweet Starlet and I recently bought a layer cake of Hello Luscious! Perfect! Thanks for the heads up. Sounds fun. Picking a favorite pattern is tough but I will go with Promenade. Thanks for the chance to win. Oh that's a hard decision! I do like Sweet Starlet a lot. Happy Churn Dash is very nice too! My favorite is "Hello Zigzag"! I am already a follower! Thanks! My fave is Sweet Starlet! Ooooooooo, that Sweet Starlet one has sure caught my eye. Thanks for the chance! I like the Happy Churn Dash, but I have always loved that block and the red calls to me! Sweet Starlet is nice too! I love Sunday Basket Brunch. So pretty. I love them all, but really like the simplicity of the Zig Zag. I do follow your blog via google reader. I love the sweet starlette quilt. I love the zig zag and the simplicity of the churn dash. I love Hello Zig Zag. Thanks for the giveaway! I think Hello Zigzag is my favorite. I like all of them and the fabrics they are made of really make them beautiful. My favorite.. umm.. the starlette, no no.. the zig zag.. no the starlett... no the zig zag... shoot! I cannot choose I love them all! Im an old timer, follower. Zig Zag quilt pattern is my favorite. I love Sunday Basket Brunch. Happy Churn Dash is very pretty and I would love to give it a try! They are all lovely and the only way I can choose it to say that the Happy Churn Dash has a super cute frog on it, so that is the one I like. 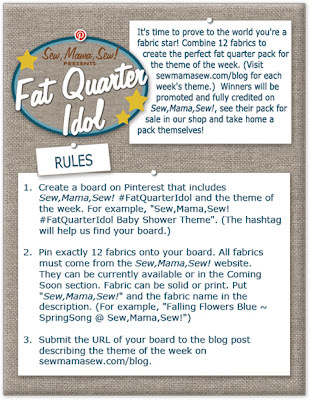 I think if I won that one, I would make the quilt and frame the pattern. I am a follower of your blog. I really enjoy reading it. My favorite is Sweet Starlet. Thanks for the giveaway. hmmm, I think I'd have to pick 'Sweet Starlet' Thanks for the great giveaway! My favourite it the sweet starlet. All are fabulous. Thanks for the giveaway. Oh I am just in love with the zig zags. I've been on a big zig zag/chevron kick lately. I just bought Hello Zig Zag so I think my second favorite would be Sweet Starlet. Oooh, to choose is so hard! Thanks for the chance to win! I think I like the Zig Zag quilt best, although Promenade is a close second! And of course I'm a follower!! Thanks for the chance to win!! I love all 5 patterns but my favorite would be Happy Churndash. I love coming to your blog full of inspiration. I am a regular follower. If I have to pick a favorite it would be Sweet Starlet. My favorite is Sunday Basket Brunch. Hello Zig Zag is my favorite!!! My favorite is Sweet Starlet. I love all your patterns! I'll just say that Sweet Starlet is one of my favorites. Thank you for a super giveaway and a chance to win a beautiful pattern. Hello, Im a new follower. I just started blogging yesterday and I am loving it. My favorite is the Promenade. It reminds me of a quilt I remember my grandmother working on one winter when I was just a little girl. All five patterns are lovely and the colours used here are just - WOW! My favourite is the Hello Zig Zag! Sunday Basket Brunch is super pretty. It's Hello Zig Zag for me! I just love love love the big Star!! I love the zigzag . AND I follow you via reader. My favourite is the sweet starlet! But, wow, they are all great! I L O V E the starlet! Love them all, but I think Sweet Starlet is my favorite! 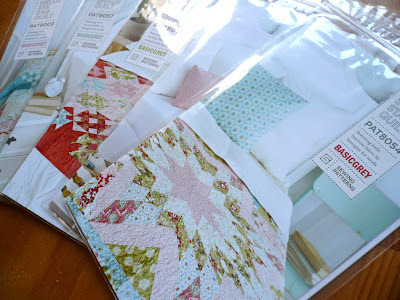 I love that Happy Churn Dash quilt! It is so fun! I hope you are doing ok! I just saw your last post about all of your newfound free time :( Hope the job hunt goes great! I love Sweet Starlet the best. Thanks for the giveaway. My favorite is "Sweet Starlet". I'm torn between Promenade and Zig Zag - love the movement in both! Oh such pretty quilts. I would say Hello Zig Zag is my favorite, mostly because I think that I could create it. I will be heading to their site to check it out. Gorgeous - gorgeous - gorgeous! My favorite is Hello Zigzag. Thanks for the chance to win! I like Hello Zig Zag. Oooh, pretties! They're all lovely, but the Sweet Starlet is definitely my favorite! Thanks for the giveaway chance! 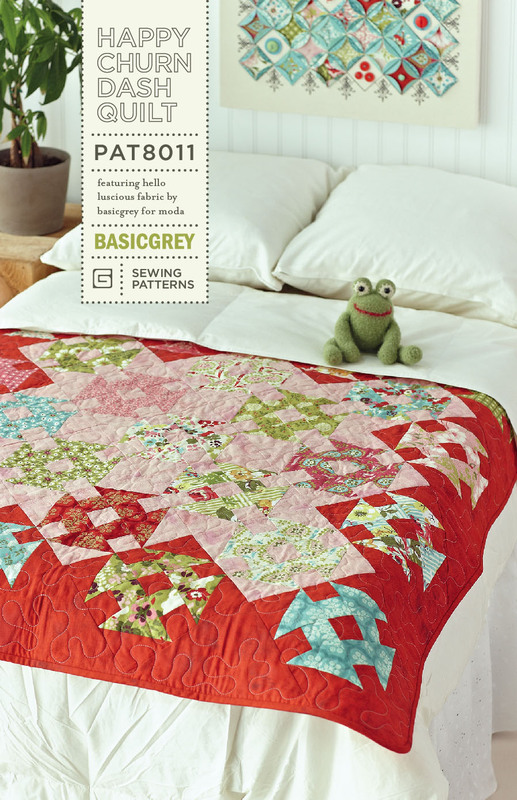 I love that Promenade quilt! So pretty. i like promenade the best, but they are all amazing! I am such a sucker for the Happy Churn Dash pattern, I have no words! And I am a long-time follower! I love the Happy Churn Dash! This pattern is very sophisticated and really beautiful. It has to be Promenade! All five are beautiful...but the one that really catch my eyes is "Promenade"!! I think Sweet Starlet is my favorite, but it is a very hard decision! Oh! I really like them all, but Sweet Starlet is my favorite. Thanks for the chance! I LOVE sweet starlet!! thanks for the chance to win. 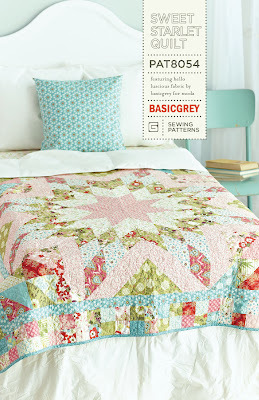 Basic Grey + Quilting = perfection!! Oooh! So hard to choose, but I'll have to same the Promenade is my favorite!